After recently losing someone very close to me from this war, all I saw from this image was pain and sadness. I was immediately reminded of everything that went along with the death of my loved one. There has been so many lives lost in our war and this images shows it. After overcoming my initial reaction I toke notice of the wording” Identify the gay solider.” I then realized that this is meant to be a statement for the discrimination of gays in the military. No matter what a person is gay or straight, the people in these caskets died for our country. there is no difference between the dead soldiers in this image. They all have American flags protecting them, making them all Americans.Even if they do have a little rainbow flag in their heart, they are honored to be a part of the American Military. Every person should be honored for their sacrifice regardless of their social views, because they are all still fighters for our country, as this image clearly demonstrates. Along with molly i agree up this is sad and a disgrace to our country. while it may be just a cartoon propaganda for the “dont as dont tell” military policy it should be brought up with death. One can see this through a indexation sign of the caskets symbolizing death. This is symbolic due to the fact that these are Americans soldiers that died for our country fighting for our rights that we enjoy on our everyday basis so so this image is a little disturbing. Still after death we are willing to bring up the question of gays in the military. I believe that they should have a vote within the military and have them decide what is right or what isn’t. Until there is clear message of what we are trying to do here. This right here is a postmodernist propaganda a in the sense that it is dealing with a issue that arises out of today society. so when it says “Identify the Gay Soldier” is the powerful statement that allows this picture to steer the pot. As a child of a retired military officer I understand what a great honor it is to serve in the military and all the sacrifices that it comes with. This image shows one of the greatest sacrifices that a solider can make. Death is a high possibility that our soldiers face everyday in order to protect their country and uphold their beliefs. We often pride ourselves as Americans in believing in equality. So it is surprising to me that a policy of “Don’t ask don’t tell” is still very much alive. 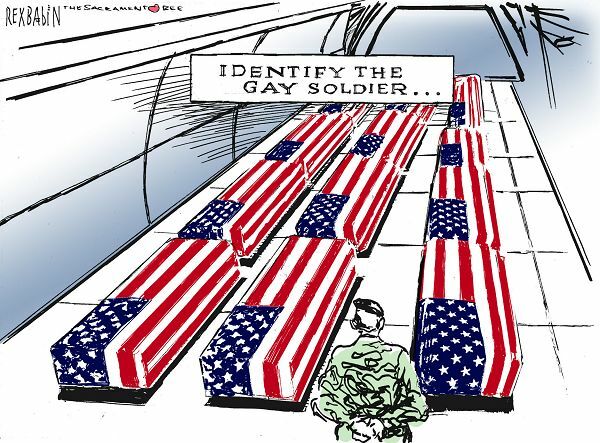 This image illustrates several soldiers that have made the ultimate sacrifice and challenges the audience to “Identify the gay solider…” Obviously we aren’t able to because the caskets are identical. Thus this image is suggesting that regardless of sexual orientation soldiers should not be discriminated against. They too put their lives on the line just like any other soldier and strive to protect their country. So it is quite contradictory that the country they fight for, the one that aims for equality, in turn actually holds a quite prejudice policy.